This pattern takes a bit of practice, but looks like the ones we used to get when we were young. A palm frond about 1/4” wide and 13” long will make an average size cross. 2. Bend the right end straight up from the center to form a right angle. 3. Fold this same top strip, from the center, (a) back and down, (b) up and over again, to form a square at the back. It will still be a right angle at this point. 4. Bring the left strip forward and fold over the center towards the right. 5. Fold away from you and pull through the square at back, all the way. 6. Bend the top strip forward and put the end through the center square to make a shaft of desired length. 7. Fold left hand strip backwards and put through the back square. This makes the left crossbar and should be in proportion to the shaft. 8. 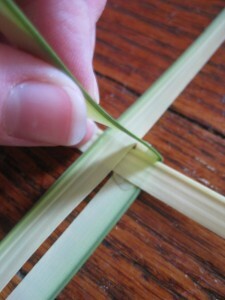 Fold the right strip back, put through the back square and fasten.